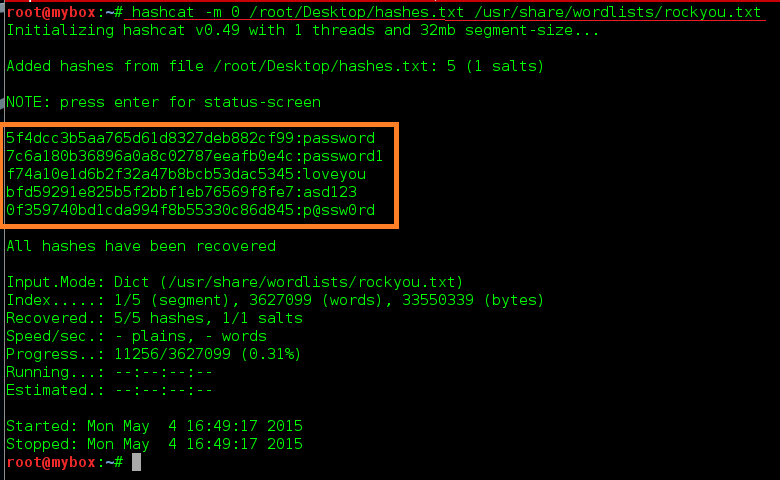 Hello friends, you reading articles on Password cracking under Penetration Testing this article will cover about another tools hashcat tutorial. It is best password cracking tool. and give the best result with GPU Machine. According to official website Hashcat is the world’s fastest CPU-based password recovery tool. In this attack hashcat create password list by combinator method in this method each word of a dictionary is appended to each word in a dictionary. hashcat is that cpu hashcat does the combination of the plains given in a single dictionary file (word list) This implies that one should specify only and exactly 1 (dictionary) file within the command line for hashcat (besides the hash file). The combinator attack hence will combine each and every word within the single dictionary file. In Brute-Force we specify a Charset and a password length range. 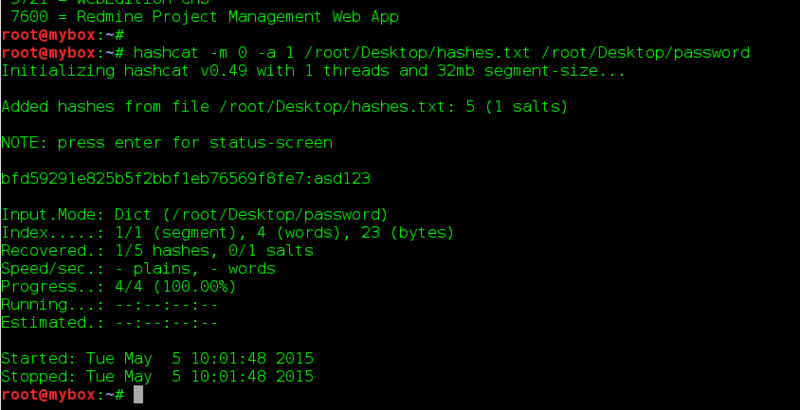 The total number of passwords to try is Number of Chars in Charset ^ Length. This attack is outdated. The Mask-Attack fully replaces it. The dictionary attack is a very simple attack mode. It is also known as a “Wordlist attack”. All that is needed is to read line by line from a textfile (called “dictionary” or “wordlist”) and try each line as a password candidate. Try all combinations from a given keyspace just like in Brute-Force attack, but more specific. The reason for doing this and not to stick to the traditional Brute-Force is that we want to reduce the password candidate keyspace to a more efficient one. In traditional Brute-Force attack we require a charset that contains all upper-case letters, all lower-case letters and all digits (aka “mixalpha-numeric”). The Password length is 9, so we have to iterate through 62^9 (13.537.086.546.263.552) combinations. Lets say we crack with a rate of 100M/s, this requires more than 4 years to complete. In Mask attack we know about humans and how they design passwords. The above password matches a simple but common pattern. A name and year appended to it. We can also configure the attack to try the upper-case letters only on the first position. It is very uncommon to see an upper-case letter only in the second or the third position. To make it short, with Mask attack we can reduce the keyspace to 52*26*26*26*26*10*10*10*10 (237.627.520.000) combinations. With the same cracking rate of 100M/s, this requires just 40 minutes to complete. A Mask attack is always specific to a password length. For example, if we use the mask “?l?l?l?l?l?l?l?l” we can only crack a password of the length 8. But if the password we try to crack has the length 7 we will not find it. Thats why we have to repeat the attack several times, each time with one placeholder added to the mask. This is transparently automated by using the “–increment” flag.